In a blender or food processor, combine mint, sage, sunflower seeds and olive oil. Once well blended, stir in the Romano/Parmesan. Cook your pasta per manufacturer’s instructions. Remove from heat and drain. 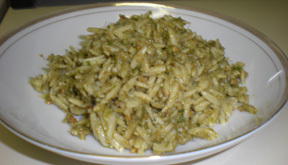 Stir in the pesto and serve.